Survey Analytics has developed a new feature to send push notifications for those running SurveyPocket on iOS mobile devices including your iPhone and iPad. In the next few weeks, this new feature will also be rolled out to Android mobile devices. 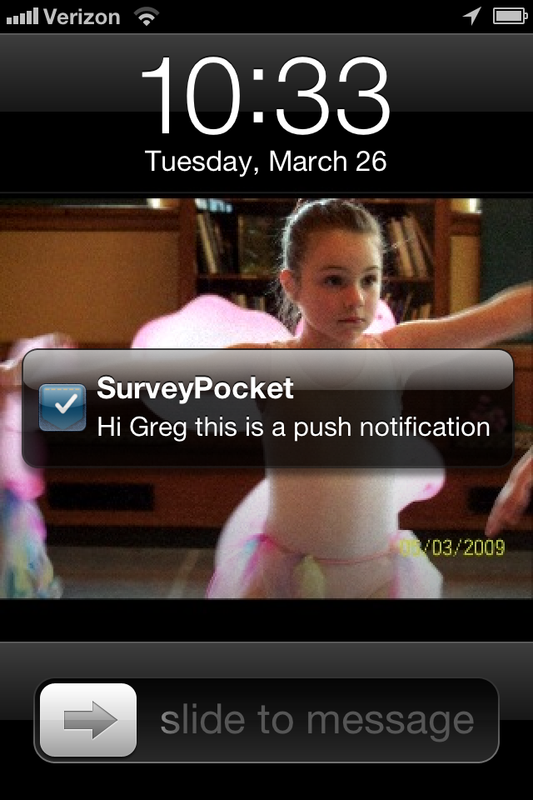 To ensure that push notifications will be received, please make sure that the SurveyPocket user has notifications enabled. You can do this from your iPad or iPhone by going to Settings -> Notifcations -> SurveyPocket -> and making sure alerts are enabled. SurveyPocket push notifications use the Apple notification services and native iOS technology for your assurance of notifications being delivered. If there is no Internet connection available on the device you push a notification to, Apple will queue the message until an Internet connection is found. This is much different than traditional SMS messages that get lost if they are unable to be received right away. As of today, push notifications have to be sent individually to each device, but users can look forward to the near future with ability to group device keys, update push tokens and bulk, and the ability to push the notifications to groups. Below is a video demonstration of how you can easily send a push notification to any device loaded with SurveyPocket from your Survey Analytics account. If you are not a current user of SurveyPocket you can give the Survey Analytics Enterprise Research Platform a try with a free trial.